Action Camp is only days away -- thank you for your patience -- we are now posting the nearly-final program schedule -- though it will NOT be final until Camp is over, because every single time block includes 2 structured offerings and one slot for those who come with something to lead / share / train others. We can, of course add even more slots -- but this is a start! In other words -- this is YOUR CAMP -- and the program has space for YOU! Some folks will be arriving on Thursday. Our first community meal will be Thursday Dinner. Our last community meal is breakfast Monday. MEDIC TRAINING is concurrent with the other programs. Medic training participants will share meals and evening program only. If you have not already, please email medic@reclaimpowersoutheast.org for more information and special "what to bring" list. Our program -- structured workshops -- will begin Friday noon (see links below). You are welcome to arrive at camp at any time, but if you intend to arrive after 10 pm, please do call -- 828-242-5621. THANKS! 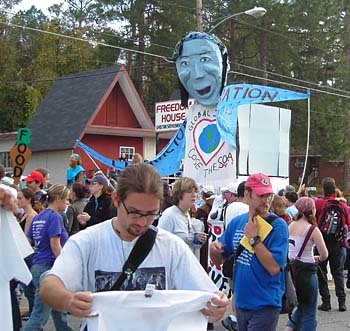 Workshops will include: community organizing, anti-oppression, direct action 101, debunking false solutions to climate change, blockades, sustainable living systems, media, disaster response, street medic training, 197 methods of non-violent direct action, fighting nukes and coal, and much more. About 1/4 of the programming time will be left open so those who are inspired at the time to lead a session or those who prefer to "drop into strategic planning" sub-groups will have time and space to make that happen.